The step between acknowledging an issue and deciding to do something about it is significant and can be daunting. But it should not be. Below are tips and recommendations for anyone and everyone to inform themselves about the do’s and don’ts of effective policy change. These notes were compiled from a recent Refugee Conference. 1. Target the right people — With a specific problem start locally and work up. Talk to the agency delivering the service. Write to the responsible minister or Department. Use your Assembly Member to influence policy in Wales such as on health or education. Your MP can influence UK-wide asylum policy. 2. Think and do research — Before you lobby, search, for instance for Welsh Refugee Coalition papers, Welsh Refugee Council and City of Sanctuary evidence. 3. Form alliances — For issues that affect many people. Use existing policy positions. 4. Limit you request — To what that person is responsible for and build relationships. Be ready to influence several bodies to change their approach before you achieve a solution. UK Government — Immigration, asylum decisions, legal aid, asylum support, repatriation, asylum seeker housing, human trafficking, resettlement programmes with local authorities, right to work, policy and legal framework, funding and contracting for migrant support, wider welfare and employment support. Welsh Government — Health, education and skills services, economic development, poverty and social inclusion, local transport and housing (except asylum housing), policy, law, funding… Can influence local authorities and others. Local authorities — Implementing resettlement programmes, education, environmental health, social services, homeless prevention, transport, other local services after grant asylum. Members of Parliament — Can raise policy concerns on your behalf eg. with Ministers, or through commons debates, bill amendments, questions, early day motions or inquiries. They can potentially help raise profile of ‘hard’ cases or help change their party’s policy. The All Party parliamentary Group on Refugees including MPs and peers can press for change on specific issues (eg. unaccompanied children, human rights in different countries…). Assembly Members — Can similarly raise profile of policy concerns on your behalf or through questions to Welsh Ministers, Send debates, amendments or inquiries and influence their party’s policy. 1. They work for you. MPs represent their constituents who have the power to vote them back in or boot them out, so they do care about what you think. 2. Find who your MP is — They often have a website where you can find out when they hold surgeries around the constituency and then get in touch to book an appointment. MPs will only deal with people who live in their constituency so make sure to include your address (postcode) when you get in touch. 3. Send an email. MPs get large volumes of emails every day on a range of issues so do your best to make yours clear and concise, clearly setting out what you’d life them to do. If you’re taking part in an ‘email your MP’ action, make sure to personalise your message to increase the likelihood of your email having an impact. 4. Get in touch via social media. Many but not all MPs are on social media. This can be an effective way to publicly press them on certain issues but be careful to ensure the tone is not too confrontational or to go down the ‘naming and shaming’ route as this can jeopardise a future relationship. Social media is a good way to highlight your MP’s support for a campaign and give them public recognition for their work. 5. Pick up the phone. While you are unlikely to speak to your MP directly, you can book a meeting. It’s usually best to call the constituency number provided (rather than the Westminster number). If you have an issue you want to discuss, sending an email is often a good first step to allow your MP to consider the issue and their response. But if your issue is urgent, a phone call could allow them to take action sooner rather than waiting for a meeting. 6. Meet in person. MPs hold regular surgeries where constituents can come along and raise issues of importance to them. Don’t be intimidated by the prospect of a face to face meeting. Go to the right person. Your MP can push for change in the UK policy or take up a specific case. If the policy is devolved to Wales you should talk with your local or regional Assembly Member. You can also write directly to the responsible Minister. Come prepared. Be sure to use arguments that make sense to them, not just you. Make sure you know about your MP including the issues they particularly care about. This should help you to understand their position on the issue you want to talk about and allows you to consider the messages which could resonate best. Be clear on how they can help. Be clear on what you would like your representative to do about the issue you’ve brought to them. Keep to time. MPs have very busy schedules so make sure to ask at the start of your meeting how much time you have and stick to it. Try and get your top messages across as quickly and simply as you can. ‘Offer them the ‘hero’ opportunity’. Offer them the ‘hero’ opportunity. Consider how backing your issue will play out for your MP in terms of impact on voters, important constituencies and local press. If you can frame your issue as an opportunity for your MP to step in and ‘save the day’ while gaining sature and visibility, they may be more likely to back you. Bring the experiences of refugees and asylum-seekers. MPs don’t often hear from people who have been through the asylum system, and sometimes hearing from them directly can have the most impact. Consider how you can provide a platform for refugees ans asylum-seekers to ensure their voices are heard — whether by attending a meeting directly to share firsthand experiences or by using anonymised anecdotes ans stories. Work with others. Consider bringing a group of people to your meeting who represent a diverse group of constituents. MPs are more likely to take notice if varied members of the community unite behind an issue. Follow-up immediately. Send a follow-up email or letter after you’ve met summarising your key points and the action your MP agreed to take, as well as asking them to feedback on the outcome of their action. Assume knowledge. While MPs may come across confidently engaging on a number of issues, it is impossible for them to now them all in depth. Rather than launching into detailed policy discussions, think about how to introduce your issue clearly and simply. Spam your MP. Personalising emails increases the chance that your MP will read and respond to your message — note that you are a constituent and make sure to add why the issue is important to you. Ask for the impossible. Make your request as clear and practical as possible. If yours is a specific ask that can be carried out fairly quickly then use it as a stepping stone to your next ask. If you want to change a whole policy area consider the series of actions that can be taken and be prepared to find allies who will work on a sustained campaign. Give up if you hear no. If your MP disagrees with you, ask why and make sure to understand their motivations. Then you can go back to the drawing board, try to sport flaws in their arguments and consider how to build a more compelling case. What does Brexit mean for the future of Welsh universities? The 21st century has seen Welsh universities flourish as student enrolment and campuses grew seemingly without limit. The higher education sector in Wales now directly contributes around £1.4 billion to the economy and indirectly powers around £1.4 billion through dependent industries. This growth was in part facilitated by the European Union, through funding grants or loans to Welsh institutions or through the student mobility and research collaboration that freedom of movement allowed. Brexit will have profound effects on Wales, but the higher education sector will feel particularly exposed as an industry heavily linked to the EU. In recent years, British universities have embarked on a building binge. At the end of 2014, annual capital expenditure by British universities had reached £2.5 billion, with 500,000 square metres of new space being added. The rough equivalent area of around five new universities. Welsh universities were no exception and saw major expansion. Swansea University recently opened its Bay Campus, which has allowed the university to double in size and further act as an engine of economic growth for the region. The funding for this huge expansion came from three chief sources: the Welsh Government, EU and European Investment Bank. Indeed, the funding from the EU amounted to £95 million. To the east, the opening of the prestigious Cardiff University Brain Research Imaging Centre was made possible in part by £4.5 million of European funding. Welsh universities have been expanding dramatically and while the rise in student fees has resulted in a drive to energise facilities to improve student satisfaction, the money to turn proposals into reality has often come in contribution from EU institutions and there is no certainty that an alternative funding stream will be created after Brexit. Funding for campus expansion is not the only place that Welsh universities have benefited from European cash. Funding for research to British institutions from the EU amounts to around £1 billion a year. In Wales the EU contributes around £35 million annually towards research or about 16% of the total Welsh institutions receive. In the rest of the UK the private sector is responsible for around 45% of total research funding but in Wales this drops to around 10% highlighting a greater dependence by Welsh institutions on European money compared to their British peers. The quality of research an institution puts out is a key barometer for its quality and any loss of research funding could detrimentally effect the quality and global standing of our universities. While the financial connection of Welsh institutions to the EU is clear, the human link is just as valuable. Around a sixth of researchers at British universities come from elsewhere in the EU and any change in visa arrangements could make Wales look less attractive and result in a drain of academic talent and a difficulty to cooperate on future European wide projects. Around 17% of Cardiff Universities academic staff are EU nationals and the presence of academic talent from across Europe has been vital to the success of Welsh institutions. Student applications have already seen a decline, with an over 8% decrease in applications to Welsh universities from EU students. A fall in EU students has the potential of reducing the roughly £130 million they put into Welsh universities and their local economies. Indeed, the onset of Brexit is a factor that Prof Colin Riordan, Vice-Chancellor of Cardiff University has acknowledged will “probably” lead to a decline in applications. The support Welsh universities will receive post-Brexit is unclear and this situation is likely to continue in the short term. But what is clear is that the expansion of universities in Wales has in part been driven by the financial and human input of the European Union. If higher education in Wales is to continue to thrive, it needs the support of a state that recognises the huge impact it plays in contributing to the prosperity of Wales and its people. On Tuesday 21st March, the Welsh Centre for International Affairs and Hub Cymru Africa hosted an evening with Gareth Owens, Humanitarian Director at Save the Children. We have created a short summary of Gareth’s advice for pursuing a career in humanitarian aid that we hope you will find useful. With Gareth’s educational background in civil engineering, he made clear that you don’t need to physically train in humanitarian work, rather you can get involved from any career angle. Working in humanitarian aid is not glamorous and it involves dealing with a lot of raw emotions and different people. It is not for everyone but is best viewed as a selfish job. You will be away from home for months at a time, often in very dangerous places so must understand the worries your family back home will have. Passion and persistence are key! The more passionate about something you are the greater chance you have of seeing it through and making change happen. Continually possessing a good character where you don’t let things get personal is important. If you’re a difficult person this is not the job for you, you must be humble and energetic as well as being able to embrace different cultures and share compassion for the people whom you are helping. Gender does play different roles when working in humanitarian aid, sometimes you will work in countries that are uncomfortable for women and at other times being a woman can be an advantage. Speaking additional languages is always a bonus, especially French and Arabic as these are most widely spoken in developing countries. Try to volunteer in your home country if you are starting out; there are many refugees now here in Britain and charities are always looking for help. Also, volunteer projects abroad are good. The more you can get on your CV from little projects like these, the better chance you have at making contacts and stumbling onto your big break. You may find it takes several years working on little projects here and there before you manage to go abroad and help on the big disasters. It is Hanna who first introduces me to the concept of political tourism – a concept she has been looking at in her PhD thesis, an ethnography of the journeys of Machsom Watch members from their homes in Israel to the checkpoints between Israel and the West Bank in order to monitor the treatment of Palestinians crossing these checkpoints by IDF soldiers. Political tourism involves a journey in space and time but also between two different cultures, with an aim to witness and create sociopolitical change. Towards the end of my visit I experience periods of self-doubt. Why do I repeatedly come to the area? To scratch at the wounds of the other? To confirm a particular political standpoint? Is what I am doing really voyeurism, and do my visits do any good? Could I, in fact, do more good by being active at home? All these questions are valid, and worth looking at in some detail. One reason for visiting the region on a fairly regular basis is to come as a witness and to stand alongside those who are suffering. This largely means Palestinian communities because of the effects of the military occupation and harassment by radical settlers. During my visit I receive the latest EAPPI update from the teams in the field. Their reports show that abuses of human rights have dramatically increased in 2016, including an increase in displacements and house demolitions in East Jerusalem and the West Bank. Coming to the area and witnessing the effects of these policies on ordinary people is very powerful, especially as this truth is rarely conveyed in the Western media. Although I haven’t been directly involved with EAPPI this time, I have heard how the Occupation affects the lives of ordinary people in Hebron and Gaza. It is very important for people affected by violence to feel that they are heard, validated and taken seriously in a world that has largely ignored them. For political tourism to be authentic, there should also be a desire on the part of the ‘tourist’ to be open to learning and change. Meeting Rachel and Jenna this time helped me to realise that there are Jewish settlers living on the West Bank who wish to work for peace and understanding with their Arab neighbours. I may not agree with their decision to live where they are, but I cannot doubt their sincerity in wishing to work towards a more peaceful society. To address structural injustice, it is government policies that need to change and individuals like Rachel and Jenna may just help to create the social pressure which is necessary to trigger political change. There are a number of factors which need to be taken into account by those campaigning for a more just and peaceful society. As a political tourist I am hugely privileged in that I am able to return to a relatively peaceful stable society. The people I am standing alongside largely don’t have that privilege. I am also aware that I am relatively empowered, whereas the people we are working with are to a large extent dependent on the rules and whims of military authorities which control their movements. To be authentic and sincere we need to recognise these inequalities, and to approach the work we are called to do with humility and respect. For women like Hanna these challenges are to be felt even more keenly as it’s her government that is the oppressor. She works for political change, knowing that change could mean radical change for her own society. For our actions to be sincere and authentic, we also need to act on what we have witnessed on our return home – by telling others what we had witnessed and campaigning for change. Nor should the fact that we are active in seeking solutions to the Israel-Palestine conflict mean that we are inactive elsewhere. We should speak out against human rights abuses and social discrimination wherever they occur – at home and abroad. On my last morning Hanna and I visit her local park and shopping mall. Here we seem a million miles away from the noisy, dusty litter-strewn streets of Gaza. Even here, however, there are factors which indicate the nature of Israeli society. Hanna points out the fact that nearly all those serving in the shopping Mall are Palestinian Israeli. On observing more closely I see that she is right. Socio-economic discrimination seems to operate in Israel itself for the Palestinian minority (around 20% of the population). Just before I leave Hanna is keen to show me a couple of YouTube clips which give her hope. These are of the singer Ziv Yehezkel, born into a traditional Orthodox Jewish family, but who has learnt about traditional Palestinian oud-playing and singing, and taken the tradition to his heart. He now performs traditional songs and melodies alongside a Palestinian Israeli soprano Nisreen Qadri, backed by the Jerusalem-Andalou orchestra. As with Violette’s Nasijona project, Hanna dreams of an intergrated society where Israelis and Palestinians can live, work and be creative alongside one another, respecting one another’s culture and heritage. Like Violette, Hanna seeks for hope through the creative arts. met in 2004 when Violette was part of a visit of Israeli and Palestinian peace women to the UK organised by ‘Women to Women for Peace’, and have kept in touch ever since. A Christian Palestinian Israeli and active within ‘Sabeel’, Violette remembers 1948 and how Galilee was before the formation of the Israeli state – a place where Muslims, Christians and Jews lived side by side and cooperated. She used to run a pharmacy in the centre of Nazareth, and has degrees from both French and Italian universities. Over a delicious breakfast of pizza-type bread topped with zata’ar, parmesan cheese and labane, we talk about the work that Violette is involved in at the moment. She is concerned that Palestinian culture is being lost and wants to find creative ways of keeping her heritage alive. She shows me a YouTube clip of a drama created by her daughter Faten called ‘Living Stones’ in which the stones of significant buildings come to life and reveal the history and culture of the place. We also talk about ‘Nasijona’, a project that Violette is creating in Nazareth, which aims to bring women together to revive handicrafts which are in danger of dying out, but also to recreate the harmonious Nazareth community that Violette remembers. When I visited last year, the project was just an empty building and an idea. Violette describes how the idea has now taken off and inspired women of different ages, backgrounds and faiths to come together. We talk about barriers and the actions necessary to remove them. Violette tells me a story of one of the founder members of Machsom Watch – the Israeli organisation that monitors the checkpoints (Machsom means ‘barrier’ in Hebrew). Despite the fact that this woman had set up an organisation to monitor the abuse of human rights and the harassment of Palestinians at checkpoints, she had still been wary of visiting Violette in Nazareth, a predominantly Arab city. This demonstrates that barriers are not only physical, but accumulate in the minds of those who never meet – creating myths and monsters. She explains that ‘Nasijona’ is a combination of the two words ‘barrier’ and ‘way’ – translating as something like ‘the Way to Remove Barriers’. We visit the Silesian School, which overlooks the city. From here it is plain to see how the original Arab city is squeezed into a confined area, whereas Nazareth Ilit, the newer Jewish area of the city, expands across the hilltops. Violette remembers how, after 1948, Palestinian families fled to the Silesian monastery after their villages were destroyed and they were forbidden to return. Some were tricked into signing papers which they thought gave them the deeds to a new apartment in Nazareth, but were in fact an agreement to give up any claim to their land. The current residents of Nazareth are the descendants of these displaced people. In the afternoon we have lunch in a café in Nazareth. Violette remarks positively on the fact that the menu is in Arabic. Although Arabic is an official language in Israel, it is in places disappearing from public places, and is in danger of being supplanted by Russian. We meet with Jonathan Cook, a British journalist and commentator and share our understanding of the present political reality of what is going on in the region. I comment on the fact that I have just received the February update from EAPPI (the Ecumenical Accompaniment Programme in Palestine and Israel), which documents a dramatic increase in demolitions and displacements in Area C of the West Bankso far in 2016. We conjecture as to whether the ultimate aim of the Israeli government is to annex Area C – 60% of the West Bank. Jonathan thinks that this is what is happening, as does Jeff Halper (Director of ICAHD – the Israeli Committee against House Demolitions). Once this happens we are into an end game – the creation of Bantustans which will be barricaded in and controlled like Gaza. We talk about how good the Israeli government is at controlling the media, and agree that it’s important to keep on telling the truth about the reality we see. This has nothing to do with anti-Semitism, but is about speaking out for respect for human rights and international humanitarian law, based on values of true democracy and humanity. We finish the day by visiting ‘Nasijona’ in action. Women sit around in groups and there is an air of contented industry. Older expert needlewomen show younger women how to create traditional articles of beauty. Under their deft fingers and patient smiles works of art slowly emerge. Muslim and Christian, old and young, veiled and unveiled are joined in this enterprise – recreating heritage and community. Violette points to one striking fact: they are all smiling. This may not change the political map, but it defies a narrative of division, distrust and incompatibility. Alongside traditional handicrafts, these women are recreating a culture of trust and hope for the future. Today Hanna and I get up at 5a.m. to go to Hableh Checkpoint, where she will do her regular Machsom Watch shift. 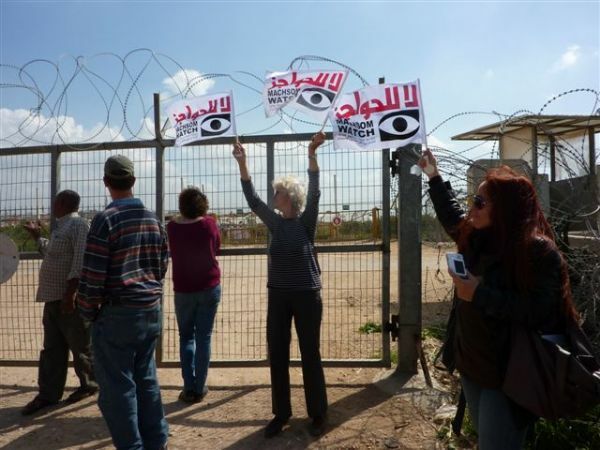 Machsom Watch is a group of Israeli women who visit checkpoints controlled by the Israeli Defence Force to monitor and document the treatment of Palestinians by the military and to report any abuses. Hanna has recently completed her PhD thesis which is an ethnography of the women’s experiences as they travel from one society to the other, and the effect this has on them mentally, emotionally and socially as they seek to identify with ‘the other’ and bring the injustices of Occupation to the attention of their own society. How near yet how far away from one another these societies are! Geographically close, of course – but in terms of awareness and lived reality, light years apart. We drive along a modern motorway that could belong to any Western society and suddenly turn off onto a potholed dusty side-road. We were so deep in conversation that Hanna almost misses the turning. Small wonder, for there are no signs, just as there are no signs to the Palestinian villages which border the road. This is part of the invisible map of Occupation – one civilisation grafted onto another which is practically airbrushed out. We reach the checkpoint gate by 6a.m. (the designated opening time) – but there is no movement. By 6.05 the soldiers have arrived and leisurely prepare to open up. Between that time and 7.30a.m. there is a steady stream of people crossing – mostly workers with permits to access their land or places of work in the Seam zone. They are allowed through in groups of 5. Some work in garden centres, others in construction. A variety of vehicles pass through – horses or donkeys and carts, cars, trucks and two school buses. (The primary school is in the Seam zone, whilst the secondary school is in the village itself, necessitating a movement of teachers and pupils.) We are greeted by ‘Good Mornings’ in Arabic, Hebrew and English – and with smiles. On the surface all is calm. This is what Hanna calls ‘the routine of Occupation’. It is clear, however, who is in control. From the uniforms and guns, of course, but also from the manner of the soldiers. At one point someone doesn’t quite obey the rules, or maybe doesn’t have the correct permit: ‘Get back, get out of here!’ one of the soldiers shouts. It can hardly be imagined what it must feel like to be subjected to this humiliation day by day just to get to one’s own land or to one’s place of work or education. What must go through people’s minds? And yet those who pass through appear calm and gracious, as if resigned. Two incidents emerge during the shift – two reasons why it was good we were there. One man stops and tells Hanna that he has applied for and been given permission to have feed for his sheep delivered to where they are in the Seam zone – but nothing has happened. The second incident happens right at the end of the shift – at around 7.27a.m. A man drives up from the Israeli side asking to go through to the village. But the soldier has already closed the gate on the Hableh side, and refuses to allow him to do so, in spite of the fact that a group of 5 men is still coming through. We later learn that this is the mayor of Hableh. What does the soldier care? He is told that he can go to the next checkpoint and cross there. People’s status in their own society is as nothing compared to military authority. And so Hanna returns home and writes up her report. She too is part of the routine, but an important part – a presence which stands for humanity and which aims to hold people to account for their behaviour. The logo of Machsom Watch is an ever-open eye. The watchful, critical gaze of witnesses is necessary in the invisible zone where most people pass by.